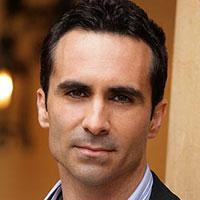 Nestor Carbonell who plays Richard Alpert, in a recent interview about his role in the upcoming The Dark Knight, confirmed that he will be returning to LOST in August. August is when production of Season 5 is supposed to begin filming, so it seems some recent rumors of Carbonell being a Series regular for Season 5 may be true after all? I think this is great news because I love his character and it seems like we will get some more answers about the island!! Here are the details, thanks to Mitchell for the heads up. What do you all think?? Latino Review has an interview with our favorite Dorian Gray himself, Nestor Carbonell aka Richard Alpert. In the interview, Nestor is asked what he has lined up, and he states, “I’m working on ‘Lost’ so I will be returning to that in August.” So, fellow Losties, it would seem that, since production on Season 5 begins in August, our man may just be promoted to series regular (fingers crossed). LatinoReview: What do you have coming up next after this? Carbonell: I’m working on ‘Lost’ so I will be returning to that in August. I’m also current working, coincidently, on the Batman cartoon. This is called ‘Batman: The Brave and the Bold’. It’s the next Warner Brothers version of Batman, the cartoon.